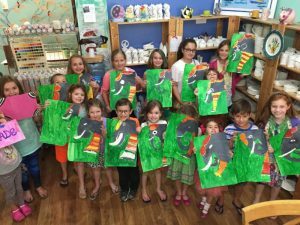 Kids LOVE Art Sea Camp! Miss Barb and her staff have been facilitating Art Camps since 2006. Some of her children that have gone through the camp are now teen helpers and staff members. In this camp your child will create two – three projects a day. Some projects may be watercolor, mixed media, pottery painting, clay, jewelry making, mosaic, poetry, painting on canvas, sketching, clay hand~building, Art Journaling, pastels and more. After the creating is done, it’s game time! Our main mission is to build self-esteem through ART. Each child must provide their own lunch and drink. Please write child’s name on all belongings. Do not wear “good clothes”… we get messy! If your child loved our camp previously, please share this with your friends!